Walking Dead's big New York Comic-Con announcement? They've found their Abraham. It's Bull from Band of Brothers... so the crush continues. Plus they've cast the mullet-ed Eugene as well! First up, NEW TOYS! 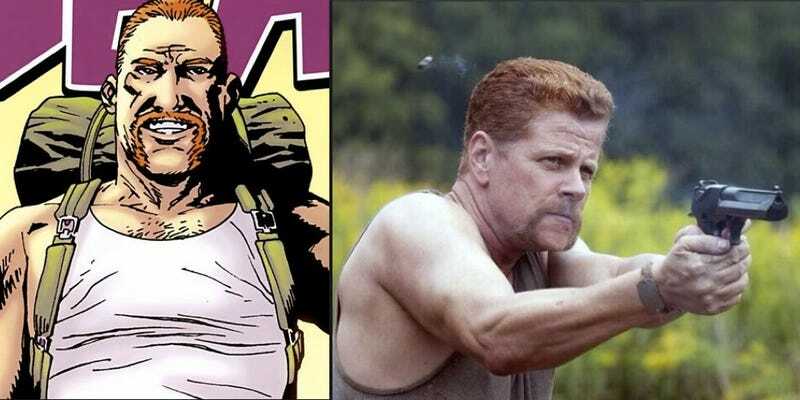 Southland actor Michael Cudlitz has been cast as big, bad Abraham—who is amazing. Very excited about this. Second Josh McDermitt (Retired at 35) has also been cast as Dr. Eugene Porter. And the panel promised he WILL have a blonde mullet. Excellent. Andrew Lincoln talked a little about the journey for Rick Grimes in the new season. He mentioned that Rick would certainly have to deal with Carl's new... progression. Now that the prison crew is better at killing zombies the best way to keep up the action is to throw them off-guard, which is exactly what the show writers and directors are trying to do. Think more swarms, zombies at the gate clumping together, and that downed helicopter. We got to see a few more images of the "moss walker" which is a zombie that has been stuck in a place for so long a tree grew right through it. It will rival the bike walker. The "Richonne" shippers were all riled up when Rick gave Michonne the "up down" in an episode where she's leaving the prison. And it was Reedus who spied it first. The two actors aggressively denied any potential on-camera hook ups. That's too bad; I could totally see the TV versions of these characters getting it on. Not so much the book versions. Video game characters from the Telltale game may make it into this season. The ninth episode of the new season blew Andrew Lincoln's mind when it comes to his relationship with Carl and Carl's progression.